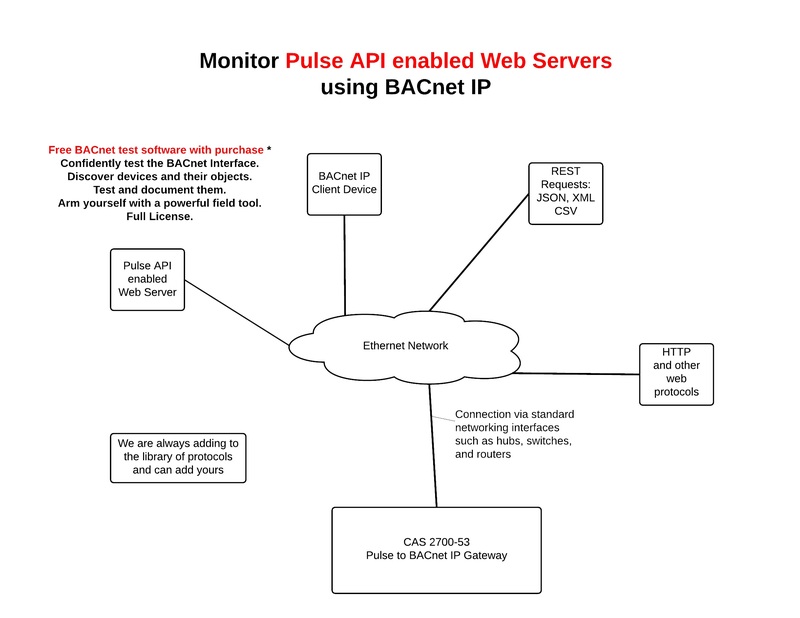 Pulse API to BACnet IP Gateway. The Pulse driver allows the Gateway to read data from a Pulse API enabled Web Server over Ethernet TCP/IP. The Pulse Driver allows the Gateway to poll a web server that uses the Pulse API for real time data. The driver uses HTTP GET requests with specific URLs to get the data as JSON packets. The CAS Gateway is configured as a BACnet IP Server device and serves the Pulse data as BACnet objects. The Gateway connects to the web server, requests the data, parses the response, and stores the data internally. When a remote system requests data, this data is then served in a form that is appropriate to the protocol, which for this driver is BACnet IP. The driver is an Ethernet driver that uses Ethernet cables and a hub or switch to connect the CAS Gateway to the internet. The CAS Pulse driver allows the CAS Gateway to read data from a Pulse API enabled Web Server over Ethernet TCP/IP. The CAS Gateway can connect to the Web Servers and send HTTP GET requests using the Pulse API to read and store data. The driver only supports read-only functions and cannot command or configure the Pulse API enabled Web Server.